Ah, tropical birdwatching. I fancy myself a late-blooming birder: after being dragged along on innumerable chilly warbler walks in the drab woods of northeast Ohio as a child, I ultimately discovered that I had caught my parents’ bug only while on a college fieldtrip to Costa Rica, watching swallow-tailed kites carve air sculptures above a plunging rainforest valley. I’ve subsequently learned to appreciate the subtler pleasures of species that skulk instead of soar, of being able (at least sometimes) to differentiate between a zillion species of fence-post-sitting yellow-breasted flycatcher-like things. But no matter how much time I spend on xeno-canto.org, I’m still basically hopeless when it comes to songs and calls. My tragic birder’s flaw is a tin ear. This is one reason I love going out with the birding groups who come to visit us at Osa Conservation (like the “Birdathon” group from Wisconsin and Minnesota that came through in late February, bringing us their northern cheer and raising money for our conservation activities). It’s always a chance to learn from the experts. When you’re standing in the middle of the forest with one of the guides or ornithologists who accompany our trips, and they suddenly whip their telescope around to train it on a vireo 20 meters away behind a liana, or single out a soft ‘chip’ among fifty different noises in the wall of green, you know you’re in good company. On a weekend in early March, I found myself at Osa Conservation’s newest conservation property, now called the Yellow-billed Cotinga Sanctuary, in just such good company. Ulises Quintero, once an OC staff member and now a guide for one of our partner lodges (Bosque del Rio Tigre ), was rattling off species names as quickly as I could write them down, distilling the dawn chorus into its component parts. Knee-deep in pasture grass, then hacking through heliconia thickets, we made our way around the 11.8-hectare parcel conducting ten-minute counts as part of an avian baseline for the new Sanctuary. By the end of two days’ counting, we had tallied 105 species, including several Neotropical migrants and endemics. And at Point 3 on our second day, the star of the show finally graced one of our ten-minute intervals: a brilliantly white Yellow-billed Cotinga (Carpodectes antoniae) flew overhead. Of course, we already knew there were Cotingas here. Osa Conservation invested in purchasing this property precisely because of its importance to these globally endangered birds. Although it’s a small parcel, half covered in cattle pasture and bordered by the Osa’s main road and the Rincón river, it turned out to be a critical feeding area for one of the few remaining subpopulations of the YBC. 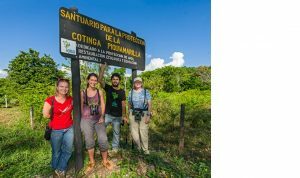 Two years of dedicated research by ornithologist Karen Leavelle showed the link between these riverside forest patches and the nearby mangroves where cotingas build their nests. Osa Conservation acted on her recommendation to purchase when the farm’s owner decided to put it up for sale. Since assuming ownership in August, we have excluded cattle from the land and begun to make plans for restoration and management. This year, we will plant trees throughout the pasture, using tall stakes of Ficus – one of the cotinga’s favored food trees – to provide early shade for seedlings of other bird-friendly species. We will create a short interpretive trail and viewing platforms (although the road and bridge already make for superb forest-edge birding), and ultimately bring local school groups as well as conservation birders to visit. To me, the Yellow-billed Cotinga Sanctuary is a great example of the model that Osa Conservation aspires to use here in the Peninsula. We worked with partners (in this case American Bird Conservancy) to answer a research question with direct conservation relevance: what habitat does this globally endangered species need to thrive, and where is it? We identified specific sites, negotiated with willing sellers, and have prevented this 12 hectares from being converted into oil palm plantation or housing. Our restoration efforts will, we anticipate, increase food resources available not only to cotingas but to other resident and migratory bird species. That’s where all those ten-minute counts come in: both here and in Osa Conservation’s other conservation properties, we conduct annual avian monitoring surveys in order to have a record of species and change over time, and to measure the success of our work. Osa Conservation is hugely grateful to the institutional donors and individual supporters who made this investment possible. Not long ago we were happy to receive and spend time at the Sanctuary with one of those donors, Cecilia Riley, Executive Director of the Gulf Coast Bird Observatory and administrator of the Tropical Forests Forever endowment. On a sunny morning by the roadside with Cecilia, her husband Mike, and the 2013 Birdathon group, the cotingas flew back and forth across the Rincón River, showing off for their potential mates and perhaps just a little bit for us as well. In order to instill an environmentally-focused culture and sense of environmental responsibility, the Public Ministry of Education (MEP) promotes the Blue Flag Ecological Program. Each year educational centers must carry out activities outlined in a work plan, which comply with the requirements to obtain the Blue Flag Ecological Award. These requirements are evaluated based on the following criteria: water quality, disaster risk management, environmental education, sanitary services, clean and safe spaces and reports of activities carried out throughout the year. Environmental education accounts for 35% of the evaluation, and Osa Conservation’s Education and Community Extension Program is helping to instigate and enforce this component in 10 educational centers through the implementation of Environmental Education curriculum. This year they have covered the topics of terrestrial and marine ecosystems, climate change and waste management. We hope that to finish out this year these 10 educational centers will achieve their Blue Flag Ecological Award, which will be a point of pride for both the students and teachers. It will strengthen their sense of belonging to the institution and to the Osa Peninsula with its great biodiversity. Each time we will be planting more seeds of conservation in present and future generations. 2013 turtle season is off to a great start for Osa Conservation! Our staff and volunteers are extremely attentive and excited. On Wednesday, February 13th, while out on their morning patrol, volunteers from our sister organization, Frontier, were pleasantly surprised to find the trail and nest of a leatherback turtle (Dermochelys coreacea) on the Pejeperro beach. Although historically leatherbacks were naturally found across a great many locations, they are currently the most in danger of extinction of all the species of sea turtles (CITES), and the beaches of the Osa are no exception. In the 2012 season, there was not one confirmed Leatherback nest, and in the past few years only a few individuals of this species have been observed on the coasts of the Osa Peninsula. So far this year tens of green sea turtles (Chelonia Mydas Agazzisi ) and Olive Ridley sea turtles (Lepidochelis Olivacea) from the Pacific have visited our beaches and have kept our staff sufficiently occupied. Our sea turtle volunteer season begins in July; however, we are already in the recruitment period for new field assistants for the 2013 season. If you are interested in being one of these assistants or in coming for a few weeks to volunteer, please contact our volunteer coordinator Hansel Herrera, hanselherrera@osaconservaton.org, and become part of this great effort to protect the sea turtles of the Osa Peninsula.